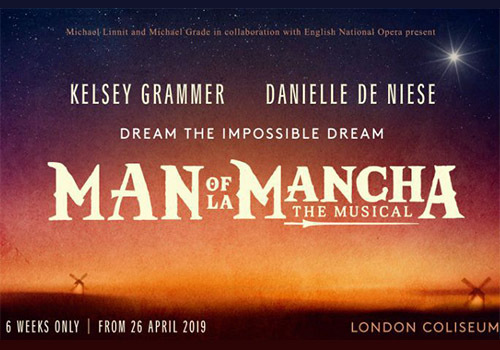 Opera singer Danielle de Niese and actor Kelsey Grammer come together to star in the first revival of Man of La Mancha in over 50 years. Presented by Michael Linnit and Michael Grade in collaboration with English National Opera, this semi-staged concert production revisits the days of the Spanish Inquisition, where an imprisoned writer dreams up a plan to save his unfinished novel. The Tony-Award-scooping musical takes its inspiration from Miguel de Cervantes’ Don Quixote. In the capable hands of its two leads and director Lonny Price, this is set to be a magnificent reincarnation of a classic. Get comfortable and listen to the story of Miguel de Cervantes, a failing playwright, poet and tax collector who makes the error of daring to tax a monastery. He is promptly jailed by the Spanish Inquisition and, while awaiting trial, is pulled before a makeshift court of his fellow prisoners, who plan to confiscate his possessions. Aware that one of these is his prized but incomplete novel; ‘Don Quixote’, Cervantes comes up with an ingenious plan to defend himself through entertainment. So follow the adventures of Don Quixote and Sancho Panza, on their quest to right the world’s wrongs. Man of La Mancha is the work of American playwright Dale Wasserman. The music is by musical theatre composer and producer Mitch Leigh while the lyrics come from musical theatre lyricist Joe Darion. Kelsey Grammer is best known for his two-decade long stint as Dr Frasier Crane in both Cheers and spin-off Frasier. He is the recipient of several Primetime Emmy Awards and Globe Awards as well as a Tony Award. No stranger to the stage, he has starred in Big Fish, Finding Neverland, My Fair Lady and more. This is soprano Danielle de Niese's West End debut. Her previous opera and musical credits include Don Pasquale, The Merry Widow and Bel Canto. They are joined by Only Fools and Horses actor Nicholas Lyndhurst who will play the Innkeeper, Cassidy Janson (Chess, Beautiful) who will share the role of Aldonza and Dulcinea with de Niese, and musical theatre legend Peter Polycarpou, who will play Sancho Panza. Among Lonny Price's recent directing credits are Sunset Boulevard and Lady Day at Emerson’s Bar and Grill. Man of La Mancha is framed as a play within a play and is supposed to be one of the most enduring pieces of musical theatre of all. Witness its latest embodiment at London Coliseum from April 2019, where it enjoys a strictly limited six-week run. The age recommendation for Man of La Mancha has yet to be confirmed. Click here for the London Coliseum seating chart and seat price guide.